Breakout Talent: Royalty Hightower on "The Fits"
“The Fits” is 2016’s little movie that could, an indie sleeper made for less than $170.000, funded entirely through grants while boasting a lean, mean running time of 72 minutes. But even though director Anna Rose Holmer’s genre-defying directing debut grossed just a bit over $130,000 when it opened in theaters last June, it has been regularly showing up on numerous year-end best lists as well as collecting award nominations, including two Spirit Award nods. Ostensibly a coming-of-age story that evolves into an entrancing if unnerving mystery about gender, physicality and adolescent cliques, “The Fits” revolves around Toni (Royalty Hightower), a watchful 11-year-old Cincinnati tomboy. She trades boxing workouts for dance routines after she is drawn into the world of an all-girl drill team and becomes intrigued when several members begin to suffer what seem to be seizures. 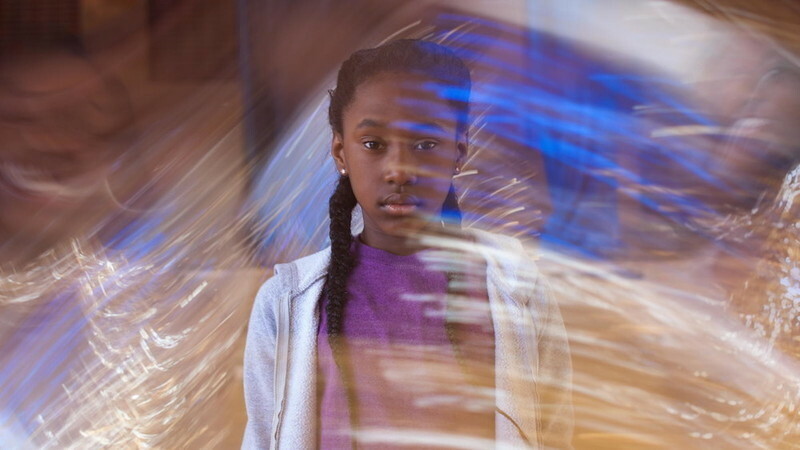 A major reason that “The Fits” has proven to be so memorable is 11-year-old newcomer Royalty Hightower, who more than lives up to her stardom-ready first name on-screen. Hightower was just nine when she and 45 other members of Q-Kidz, a real-life Cincinnati drill team whose dance moves include hip-hop, majorette, ballet and “creative dance,” were cast after Holmer saw their videos on YouTube. Now this sixth-grader, who found herself becoming part of a drill team parade as a banner holder alongside her now-16-year-old sister Yrmajesti when she was just six, is considered one of the top breakout actors of the year. Hightower has already competed for a Gotham Award (she lost to Anya Taylor-Joy, 20, of “The Witch”) and won a National Board of Review honor for female breakthrough performance. She’ll be attending the ceremony in New York on January 4. Toni might not say much as she keenly observes the world changing before her eyes. But her near-constant and mostly silent presence throughout “The Fits” makes an indelible impression. As Holmer told W Magazine, “She just has this amazing, generous capacity to listen. They say some people have ‘It,’ whatever It is. Royalty has it." This past weekend, the New York Times included her in the company of such Hollywood mainstays as Don Cheadle, Natalie Portman, Casey Affleck and Kristen Stewart in a salute to the year’s great actors. Royalty even got to participate in her own virtual-reality black-and-white film short, facing down a killer who shot her piano-playing father. Royalty made time in between drill team duties, school work and awards shows to speak about her life-changing whirlwind year with RogerEbert.com. The only drawback? Much like Toni, she is not one for idle chit chat—which, in a way, is a refreshing change of pace from canned answers, even if her mother did coach her through some questions. I just watched the film short you did for the New York Times. It was very cool. What was the setup for that story? I don’t know that much about her. It was more of a last-minute thing. You look taller than you did in “The Fits.” How tall are you now? You are 11 now but I couldn’t find your birthday anywhere. I turn 12 on March 26. We had a base learning project. And we multiplied and did fractions. You continue to be part of Q-Kidz even though you have been going on auditions for other movies. I understand you struggled to dance awkwardly in “The Fits” because you are so good with picking up steps usually. Yeah. I did have trouble being not very good. You had to learn how to box. Did you enjoy that? No, I did not like boxing that much. I am sure that you have heard many theories about what causes the girls in the film to suffer these convulsions. The film leaves it up in the air. What theories are out there? I do not have one. But most people think it is from the water at the rec center. Others didn’t have a clue what is going on. And some think it was just because the first girl did it and they were following her. Did your director Anna ever give you any hints? She didn’t talk that much about the cause or where it came from. I didn’t know while shooting what was happening to them. We kept asking but she said it was a secret. Is Alexis Neblett, who plays your friend Beezy in “The Fits,” really your stepsister? Yes. She’s a year older. It made it easier to work together and more fun because we knew each other. Everyone on set knew each other. How was going to the Gotham Awards ceremony last month? Did you meet a lot of famous actors? It was amazing and fun. They had all kinds of different famous people. I got to meet Janelle Monae. Most of the other ones, I really didn’t know. I’ve seen some of their movies but I didn’t know their names. Did a designer offer to dress you? I saw a photo of you with your hair done and a pretty black top and shiny blue skirt. I’m so used to seeing you as Toni, who only wears gym outfits and her drill team costume. I don’t know about that. Mom takes care of my outfits. I am guessing you will be attending the National Board of Review awards in New York to pick up your trophy. Will you also go to the Spirit Awards in Los Angeles to support “The Fits”? I am not able to go to that one. Do you like attracting all this attention? Have people come up to you and commented on your performance? You went to Los Angeles after “The Fits” got a great reception at Sundance and visited people at Paramount and Fox studios. I enjoyed that part. The studios were fun to see since some of my favorite films were made there. My Mom wants to move to L.A., so I can take acting classes and have more opportunities and jobs. Did you get to do any sightseeing? We went to Universal Studios theme park and ate at Ruth’s Chris. You already have a couple other films lined up. One is “And Then I Go.” It sounds like a serious film about two troubled middle-school boys. You play a character called Tawanda? What is she like? We filmed that in Los Angeles and Kentucky in July. Tawanda is trying to see everything coming. If there is trouble, she is the first one to get up and leave. She is like the person they can talk to and she stays out of trouble the most. You are also going to be in “Ruby in Murdertown,” with another female director making her debut, Leah Rachel. Laurence Fishburne, who is also a producer, plays your dad who is framed for murder in the Midwest and you try to help him. That will start shooting in the summer in Ohio. I get to drive a car. It is set in the past. Between school, your drill team, going to awards events and making movies, you have a lot on your plate. Do you like keeping busy? Sometimes it’s a lot but I am able to do my school work. I wanted to be a lot of different things when I was little. But when you are actress, you can act like anything. I have seen all the Chucky films. I like him because he is scary and funny. Did you ever think your dolls came to life like him? When I was little but not anymore. And what did you like about “Cinderella”? I like the dresses, the ball gowns and the shoes. I like action films, too. With your dance talent, did you ever want to be in a musical? That would be fun, but I can’t sing. I either dance or do flips. I do gymnastics and keep physical. If you could be granted any wish, what would you choose? I’d wish for the biggest trampoline ever, to fit in the whole backyard. You have a great name. Did your Mom ever tell you why she called you Royalty, your sister Yrmajesty and your four-year-old brother King? [Royalty’s mom gets on the phone] I never told her. I had planned on having only one child. When I had two more, I had to name them something important. What’s even better is that they all are living up to their names. Next Article: Knowing Your Family, Warts And All: Stephen McKinley Henderson and Jovan Adepo on “Fences” Previous Article: Chase What You're Afraid Of: Damien Chazelle & Rosemarie DeWitt on "La La Land"